Today, organizations face the crucial challenge of creating and managing knowledge in order to succeed. As part of the Knowledge Management process, Knowledge Socialization is a critical step during which the community experiences a decisive interchange of ideas. In this work, we present a new model for Knowledge Management based on the classic Nonaka and Takeuchi's one but adapted to the Web 2.0 by using wiki technologies to support Knowledge Socialization, and we propose to apply this model to the case of elBulli. elBulli, voted by industry authority Restaurant magazine as the best restaurant in the world in 2002 and from 2006 to 2009 (William, 2012), has now become a foundation for creativity and innovation in high cuisine. It incorporates disciplines such as technology, science, philosophy, and the arts in its research. Aware of the value of knowledge, the organization publishes its results in international conferences, books or journal articles, in a similar way to the academic process of peer review. Therefore, elBulli is an appropriate case to apply a Knowledge Management model that makes maximum use of its knowledge. In recent years, the technological development and globalization have produced significant structural changes in society and the economy. New emergent industries embody a new economic reality: knowledge has become the main economic resource (Drucker, 1969). Indeed, nowadays, knowledge is the asset that generates more value in an organization, and the competitiveness of companies depends heavily on how they maintain and access their knowledge (Fensel, 2004; Davies, 2003). Socialization is the action of sharing tacit knowledge with other individuals by means of observation, imitation and practice during collective work (for example, celebrating a meeting). 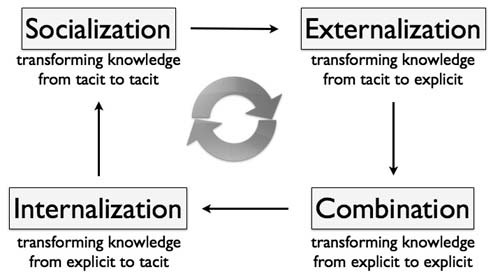 Externalization is the action of making tacit knowledge explicit (for example, writing an article) in order to share it. Combination is the process of synthesizing more complex explicit knowledge from various sources of simpler explicit knowledge (for example, building a prototype). Internalization is the assimilation of explicit knowledge. It occurs when we understand explicit knowledge through experience (for example, nobody can tell you how to ride a bike, you need to practise to learn). Socialization. Creativity and innovation implies constant learning so that its employees attend specialized courses, gastronomic fairs, research stays, conferences, etc. Externalization. Unlike the traditional model, in which a chef would closely guard his secrets, elBulli documents exhaustively all its achievements and developments since 1990 (catalogues, audiovisual resources, recipes…) and it publishes its research in conferences, books or journal articles. The combination of existing creative methods, techniques, previous knowledge and known recipes results in new creative methods and new dishes. Internalization. Cooking is a suitable example of knowledge internalization: only by practising these new methods and recipes, chefs can learn how to prepare new dishes. Adrià suggests externalizing all their knowledge onto the Bullipedia, an online database that “will contain every piece of gastronomic knowledge ever gathered”. Adrià and some of the best chefs all over the world are putting in common their wisdom to agree on the content of the Bullipedia. Their aim is to create an encyclopedia with 15,000 articles “where users will leave suggestions for dishes, concepts and combinations of flavours” that will affect, in Adrià’s opinion, other chefs’ creativity. This agreement can only be achieved through a sound process of socialization. According to Nonaka & Takeuchi’s cycle, socialization entails a transformation from individual tacit knowledge into collective tacit knowledge. This conversion is extremely hard to carry out due to tacit knowledge being highly personal, deeply attached to individual actions in a specific context (a profession, a technology…) and composed of individual’s technical skills that can only be acquired by learning and improved by experience . Hence, it is difficult to formalize and share. Multidirectional socialization given in social networks, where users adopt multiple roles (they are now content prosumers, that is, the production and consumption of knowledge is entrusted to the users (Aranda-Corral et al., 2010)). Interchange of ideas through wiki technologies. This model fits in better with the current technological and social reality. Thus, we showcase the advantages that our model would provide in a case such as that of Adrià and his colleagues when building the Bullipedia from scratch, so that they really benefit from the interaction with a large community of prosumers and use wiki technologies to exchange ideas and develop a more nuanced metalanguage that really supports this initative and make it sustainable in the long term. This approach could also be exploited in other cases of collaboration such as collective software construction, project documentation or interactive learning. Theoretical framework: the power of crowds, social networks and collaborative technologies Socializing knowledge is critical to both its evolution and its usefulness (Inmon, 2008). Knowledge Management cycle might provide better outcomes, in terms of quality and value of knowledge, by improving the socialization process. In the case of elBulli, Adrià and his colleagues are agreeing on the content of the upcoming Bullipedia. However, they discovered that the hardest part was to find a common language, that is, the worlds of science and gastronomy may share similar processes and methodologies, but they rarely intersect. We can demonstrate Surowiecki’s ideas are applicable to our model. First of all, the case of elBulli is both especially interdisciplinary and heterogeneous enough. Adrià uses “cuisine as a discourse in order to create a dialogue with other disciplines”. The foundation is a mash-up of science, the arts, philosophy and technology as a creativity-generating universe that produces knowledge (William, 2012). It is this crossroad among various disciplines what creates such heterogeneity and diversity of knowledge and opinions about the same topic (1). Secondly, advance in technology have provided novel ways to socialize knowledge. Social networks have created a new reality of social interaction (Easly, 2010; Mika, 2007) that has enabled more effective ways of agreement (Mazzega, 2011). Users organized around a wiki constitute a non-hierarchical and decentralized social network whose members are independent but collaborate (Leuf, 2001) (2 y 3). According to Complex Systems theory, members in social networks selforganize and agreement emerges from the bottom-up as a result of their interactions (Wood, 2010; Jones-Rooy, 2010). Finally, a wiki fosters the idea of prosumers collaborating on the Web as it blurs the line between the reader and the writer (Caverly, 2008). Many online communities have adopted this approach to create collective knowledge (John, 2004; Krötzsch, 2006; Ebersbach, 2006). Wikipedia, the great online encyclopedia, supports this proposition. Therefore, Wikis are a good method for aggregating knowldge and opinions (4). Turning to the crowd instead of letting the Bullipedia be constructed by a small group of experts. Use of wiki technologies, as they have demonstrated their effectiveness for collaboration. Adams, P. (2011). Grouped: How Small Groups of Friends Are the Key to Influence on the Social Web. Berkeley, CA, USA: New Riders. Aranda-Corral, G., J. Borrego-Díaz, and A. Jiménez-Mavillard (2010). Social Ontology Documentation for Knowledge Externalization. Metadata and Semantic Research: Proceedings of the 4th International Conference, MTSR 2010. Sánchez-Alonso, S. and Athanasiadis, I. N. (eds). Berlin, Heidelberg, Germany: Springer-Verlag. CCIS 108, 137–148. Brabham, D. C. (2008). Crowdsourcing as a Model for Problem Solving An Introduction and Cases. Convergence: The International Journal of Research into New Media Technologies 14.1, 75–90. Caverly, D. C., and A. Ward (2008). Techtalk: Wikis and Collaborative Knowledge Construction. Journal of Developmental Education 32.2, 36-37. Davies, J., D. Fensel, and F. Harmelen (eds.) (2003). Towards the Semantic Web: Ontology- Driven Knowledge Management. John Wiley & Sons. Doan, A., R. Ramakrishnan, and A. Y. Halevy (2011). Crowdsourcing systems on the World-Wide Web. ACM 54.4, 86-96. Drucker, P. (1969). The Age of Discontinuity: Guidelines to our Changing Society. New York: Harper & Row. Easly, D., and J. Kleinberg. (2010). Networks, Crowds, and Markets. Cambridge: Cambridge University Press. Ebersbach, A., et al. (2006). Wiki: Web Collaboration. Berlin, Heidelberg, Germany: Springer Science+Business Media. Fensel, D. (2004). Ontologies: Silver Bullet for Knowledge Management and Electronic Commerce. 2nd ed. Heidelberg: Springer. Inmon, W., B. O’Neil, and L. Fryman (2008) Business Metadata: Capturing Enterprise Knowledge. Morgan Kaufmann. John, M. and R. Melster. (2004). Knowledge Networks – Managing Collaborative Knowledge Spaces. Proceedings of the LSO 2004. Melnik, G. and Holz, H. (eds). Berlin, Heidelberg, Germany: Springer-Verlag. LNCS 3096, 165–171. Jones-Rooy, A. and S.E. Page. (2010). The Complexities of Global Systems History. Journal of The Historical Society 10, 345–365. Krötzsch, M., D. Vrandecic, and M. Völkel. (2006). Semantic MediaWiki. Proceedings of the 5th ISWC 2006. Berlin, Heidelberg, Germany: Springer-Verlag. LNCS 4273, 935–942. Leuf, B., and W. Cunningham. (2001). The Wiki Way: Quick Collaboration on the Web. Boston, USA: Addison-Wesley. Mazzega, P., et al. (2011). A Complex-System Approach: Legal Knowledge, Ontology, Information and Networks. Approaches to Legal Ontologies. Sartor, G., et al. (eds), Springer Science+Business Media: Law, Governance and Technology Series 1, 117-132. Mika, P. (2007). Social Networks and the Semantic Web. Barcelona, Spain: Springer. Nonaka, I., and T. Takeuchi (1995). The Knowledge-Creating Company: How Japanese Companies Create the Dynamics of Innovation. Oxford University Press. Schall, D., and F. Skopik (2012). 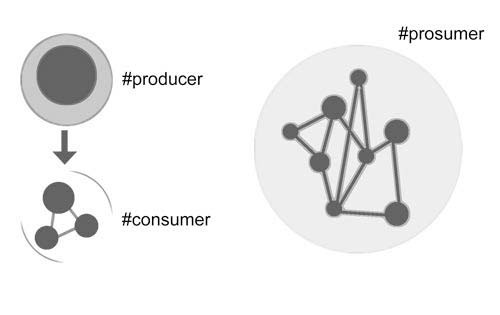 Social network mining of requester communities in crowdsourcing markets. Social Network Analysis and Mining 2.4, 329-344. Soler, J., F. Adrià, and F. Adrià (2007). Un día en elBulli. elBulli Books. Tapscott, D., and A. Williams (2006). Wikinomics: How Mass Collaboration Changes Everything. New York: Penguin Group. William, G. (2012). Staying creative. Wired UK Edition, 102-111. Wood, A. T. (2010). Fire, Water, Earth, and Sky: Global Systems History and the Human Prospect. Journal of The Historical Society 10, 287–318.